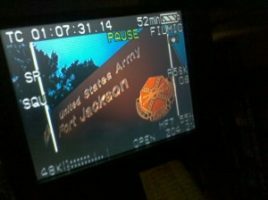 Charleston Based GTT Director of Photography Dave Baker recently went up to Columbia, SC’s Fort Jackson. The mission? To grab footage of the base for a story soon to air on ABC’s “Nightline”. Before sunrise, Dave was out at the gate with a Panasonic HVX200, and like the army, he had done more by lunchtime than most people will do in a day.